Michael Lohr is a PhD student at Edith Cowan University studying the impacts of urban and agricultural fragmentation on Southern Boobooks. He is focusing on a number of factors associated with highly-developed landscapes including Toxoplasma gondii infection, anticoagulant rodenticide poisoning, loss of nesting hollows, competition with other bird species, and genetic impacts of fragmentation. Michael previously worked as a Research Scientist at the Western Australia Department of Parks and Wildlife, studying the distributions of introduced plants on the islands of Western Australia and adjacent territorial islands. 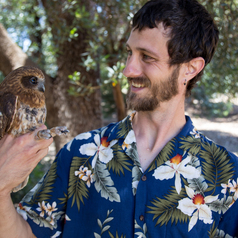 Prior to arriving in Australia, he worked as an Avian Ecologist in Hawaii where he focused mainly on seabird conservation and mitigating impacts of introduced mammals on the O'ahu 'Elepaio - an endangered native forest bird.